[En écoutant du Schumann / La Musique russe]. Art project 'Melancholia', S & H De Buck & university of Ghent Belgium 2000. 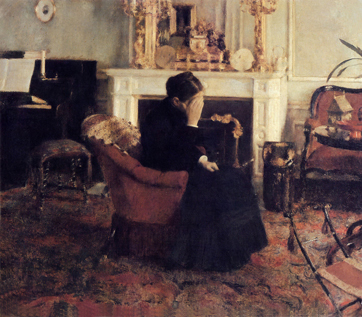 Based on a dispute between the two famous Belgium Fin de Siècle painters: Fernand Khnopff and James Ensor. Ensor accused Khnopff of plagiarism. A performance based on the Belgian painters, James Ensor (1860-1949) and Fernand Khnopff (1858-1921), who had known each other as fellow students at the Brussels Academy, had a violent polemic in response to the painting 'Listening to music by Schumann', which Fernand Khnoppf showed in that same year when it was finished. The canvas, purchased on 5 October 1945 at the Henri La Fontaine auction in the Georges Giroux gallery in Brussels by the Royal Museums of Fine Arts in Brussels, was indeed apparently influenced by the work of 'La Musique russe/Russian Music' from 1881 by James Ensor. 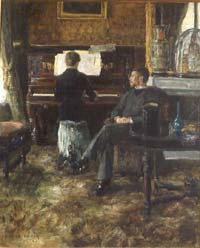 En écoutant du Schumann, Fernand Khnopff 1883 La Musique russe, James Ensor 1881. The photo above of the installtion [during art project 'Speelhoven' Aarschot Belgium 1994/1997] was published in the book 'Buiten & Binnen (outside & inside), Visions on and by the actual landscape ' by author/art historian Johan Pas. It was taken in a place that is very reminiscent of the landscape that can be seen on the original painting 'the prodigal son' by Hieronymous Bosch [1450-1516] made in 1516. That was also the main reason for placing the work on this spot. [The Prodigal Son] 1516 by Hieronymous Bosch. Collection of the Museum Boijmans-van Beuningen, Rotterdam the Netherlands. Sculpture/permanent installation public space for a birth park of the community of Zwijndrecht in Belgium September 2018. Installation / Reconstruction. The gate symbolizes renewal, change, a mental rebirth or the start of a new beginning during a life phase. The wanderer, the nomad, the refugee tries to come 'home'. Stefaan van Biesen works in his oeuvre with the concepts present/past, body/mind, culture/nature. This results in images, drawings, videos, performances in which a special view on mankind, nature and social events always is given. 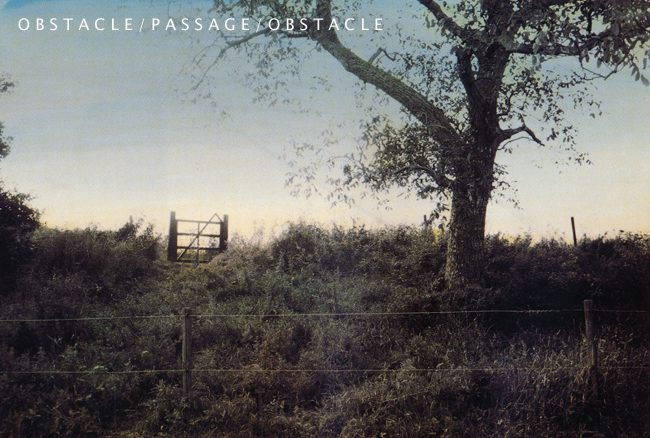 [Obstacle/Passage/Obstacle]. Integration Geboortepark Zwijndrecht Belgium September 2018. [Obstacle/Passage/Obstacle]: 'Speelhoven' Aarschot Belgium 1996 > 'Artificial Landscape' [Betoverd Bos] Schuurlo Sint-Maria Aalter, Belgium. [curator: Angelique Campens] > 'How Long Is Now?' Biscainhos museum Braga Portugal 2010 > As a permanent work in the public space: Geboortepark [Birth Park] at Zwijndrecht Belgium 2018. [World kitchen] Breugel & today' Herman Teirlinckhuis Beersel Belgium 2002. Art Project [Breugel en Vandaag]. Several artist were aksed to make a tribute to Breugel [1525-1569] at the Herman Teirlinckhuis in Beersel Belgium . The house is situated in the region where Breugel once lived and worked. 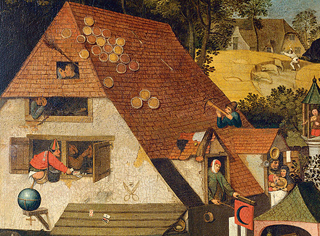 Fragments form the paintings 'spreuken' and 'Boerenbruiloft' made by Breugel. [World kitchen] Breugel & today' rooftop of the Herman Teirlinckhuis Beersel 2002. 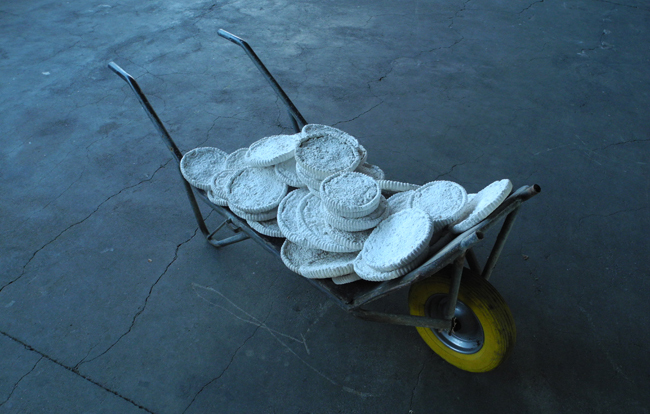 60 rice pies made in plaster. The work is based on a painting with Flemish spells from Breugel and specifically on the saying: 'There, the roofs are covered with flans' (people who live in wealth and abundance). Luxury in an unequally divided world. A permanent world problem. [Wild Man Variations] video performance. Corpus CC Ter Vesten Beveren Belgium 1998. 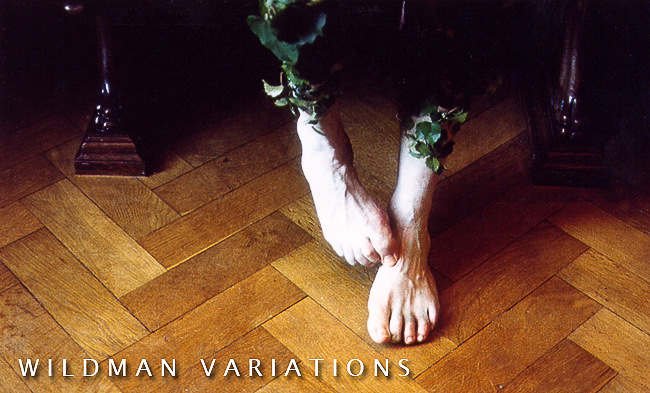 [Wildman Variations] is a video of a performance based on pagan 'wildman' paintings and wooden ornaments in the old Christian house chapel in Castle Cortewalle Beveren Belgium. Art project 'Corpus' CC Ter Vesten . The wildman is a mythical figure that appears in the artwork and literature of medieval Europe, comparable to the satyr or faun type in classical mythology and to Silvanus, the Roman god of the woodlands. Nature versus Culture. Or a desire to be 'nature', to be one with nature? The polarity between culture and nature, but also the inability to connect both. The definition of the term 'nature' is determined by culture. The term 'nature' is an interpretation, a filtered look at our environment. Maybe it is therefore a difficult concept to describe. We often forget that we ourselves are 'nature'. We often place ourselves outside of 'nature' and look at it as an observer who is detached, who has lost or denied the bond with what he is in essence. [Friedrich Walks] walks in Europe [since 1999]. Spaziergangwissenschaft. Photographs taken during several walks in Europe as an hommage to Caspar David Friedrich. Friedrich [1774-1840] was a 19th-century German Romantic landscape painter, generally considered the most important German artist of his generation. He is best known for his mid-period allegorical landscapes which typically feature contemplative figures silhouetted against night skies, morning mists, barren trees or Gothic or megalithic ruins. His primary interest as an artist was the contemplation of nature, and his often symbolic and anti-classical work seeks to convey a subjective, emotional response to the natural world. Friedrich's paintings characteristically set a human presence in diminished perspective amid expansive landscapes, reducing the figures to a scale that, according to the art historian Christopher John Murray, directs "the viewer's gaze towards their metaphysical dimension".